A compact trainer that's big on features and resistance. The bar mounted control offers 10 levels of resistance up to 950 Watts. Its smart features open up the world of virtual/online training with ANT+ and Bluetooth Smart compatibility to pair with your device of choice, allowing you to compete against other players/trainers around the world. While the Satori won't automatically adjust resistance, it gives you an adjustment alert based on your chosen virtual race course. When it's time to ride offline, it works as a regular stand-alone trainer (making it an excellent choice for pre-race warmups). 10-position magnetic brake provides up to 950 Watts of resistance. Handlebar mounted lever controls resistance levels. Folding design is compact and easily to transport. Bluetooth Smart or ANT+ connectivity relays speed and power information to your paired smart device. Free Tacx Training app lets you regulate your training ride by heartrate (sold separately), gradient, or power. 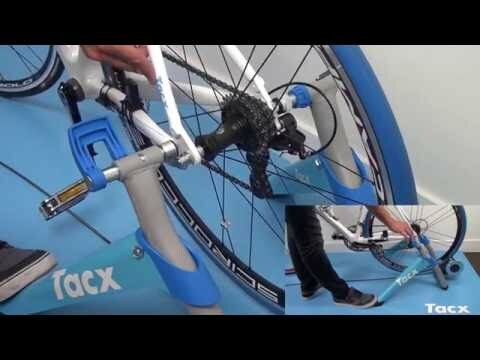 Tacx Training app offers a variety of real world courses to ride, and informs you of appropriate resistance levels to mirror your chosen ride. 1.6kg flywheel helps simulate realistic road feel. Accommodates 700c and 26-29in. wheels (trainer tire required for 29in.). Sprint power of 800W for up to 1 minute. Broad, stable frame for confident sprinting.